I put some olive oil in a skillet and heated it with some peppercorns and anise seed until it was perfuming the air. Then I added chopped onions (1/2 an onion) and one minced serrano chile and sautéed. I cut up one small parsnip and 2 carrots into thumbnail chunks and added, with a bit of salt and pepper, and cooked until nearly done. Then near the end, I added about 6 brussels spouts that I had cut in half and an apple I cut into chunks and tossed them in to cook until tender. Tossed a bit of rice vinegar on to finish. Salt and pepper. This made two large servings. This was the most delicious vegetable sauté I can remember. It was earthy and warm, piquant with the vinegar and parsnips. The brussels sprouts gave it a lovely earthiness and the chile gave it some heat. The sweetness of the carrots and apple added another flavor note. 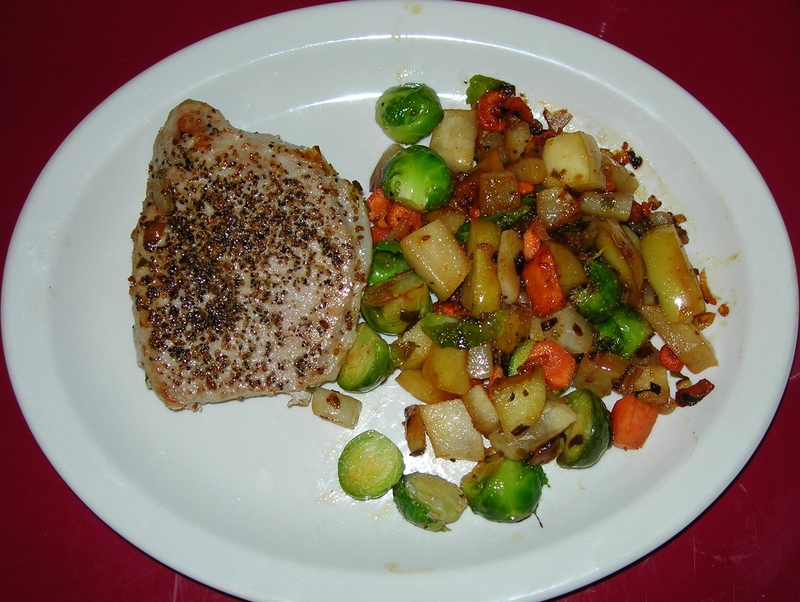 I served it with a pork loin, but it is a vegan dish that you can serve with anything.